Fearless Improv takes Delaware to task with comical sketches, interactive games, and compromising positions, all in the name of good, clean(ish) fun. These guys cook up big laughs (spiced with a pinch of bawdiness) by creating scenes on the spot that magnify the hilarity of the human experience. Come see what happens when there are no mistakes, everything is a gift, and everyone has your back. Submissions are open until March 9. 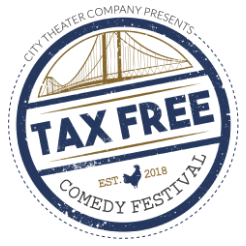 City Theater Company presents the 2nd Annual Tax Free Comedy Festival, the First State’s annual showcase featuring the best and funniest from Delaware and beyond performing stand-up, improv, and musical comedy…completely TAX FREE! Fearless Improv is presented by City Theater Company, as a Resident Company of The Grand Opera House. Join the Fearless fun on Facebook at facebook.com/ctcimprov.